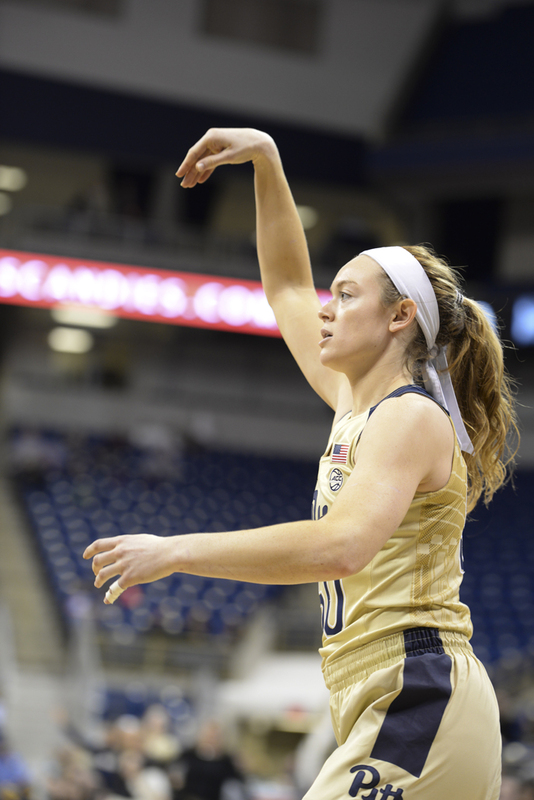 At the beginning of the season, pundits and coaches picked the Pitt women’s basketball team to be one of the worst in the ACC. But after Sunday afternoon’s back-and-forth 62-54 win over Virginia at the Petersen Events Center, the team has continued to exceed expectations and is now 3-3 in conference play, tied for seventh place out of 15 teams. While Pitt would ultimately continue to succeed in their winnable games, this was not clear from the onset. Both teams had a slow start, with the Cavaliers (13-6, 2-4 ACC) and the Panthers (12-7, 3-3 ACC) each going 1-7 from the floor by the first media timeout midway through the first quarter. After five minutes and seven seconds of play, the score was 3-2, but by the end of the quarter, Virginia and Pitt were knotted up at 12 points apiece. The Panthers were much more efficient in the second quarter, making eight of their 14 shots from the field. As a result, Pitt held a lead for the entire quarter of play. Sophomore guard Kauai Bradley was a key reason for the Panther’s success. The 6-footer from Chicago finished the half leading the team with seven points and going 1-3 from 3-point range. Cavaliers forward Moné Jones threatened the Panther’s momentum when she made a 3-pointer with 26 seconds left in the second quarter, closing the Pitt lead to five. The Panthers had trouble getting the ball out of their own half and had to call a timeout in the face of the Cavaliers’ full-court press. With seconds left in the quarter, the Panthers got the ball down the floor and first-year Jasmine Whitney weaved her way through the Virginia defense to score a closely-contested layup as time expired. The Panthers went into the intermission holding a seven-point lead, 29-22. After the game, McConnell-Serio had nothing but complimentary things to say about Whitney, who is filling in for the concussed starter Aysia Bugg. “Jasmine is so tough,” McConnell-Serio said. “I don’t think [people] understand how she plays with a herniated disk in her back. When you have a herniated disk, you’re playing through pain and it’s just how much you can tolerate.” Whitney did not let her injury get in the way of performing, however, as she spent 34 minutes on the court and scored five points. The team was unable to translate its strong finish in the first half into a fast start in the second. During the first two and a half minutes of the third quarter, the Panthers allowed their lead to dwindle down to one. The first Panther field goal of the half ended up being a 3-pointer from Pittsburgh native Brenna Wise with 6:34 left in the period, to make the score 33-28. A minute and a half later, Wise had a fast break opportunity and looked poised to score an easy layup. Instead, Virginia first-year guard Dominique Toussaint fouled her hard and Wise was slow to get up. Wise quickly recovered and made both of her foul shots to make the lead 35-32. Wise capitalized when given the opportunity, making all 11 of her free throw attempts on her way to scoring a game-high 26 points. After a pull up jumper by Toussaint and a three from junior guard Aliyah Huland El, the Cavaliers took their first lead since the first quarter with 1:05 left in the third, 38-37. The Panthers did not help their own cause, missing six shots in a row before Whitney sank a jumper with 22 seconds left in the period. Despite their poor play, the Panthers took a one-point lead into the final quarter. Virginia started the fourth quarter with an 8-2 run. Pitt’s first points in the quarter came from a layup by Wise, with 6:03 left in the game, to bring the Panthers within three. After the last media timeout, Mason hit a 3-pointer for UVA. But from then on, the Panthers seized the initiative, making four 3-pointers in a row — two of which came from first-year guard Alayna Gribble. The run sent the Panther faithful into a frenzy, and the crowd remained a factor for the rest of the game. With 21 seconds left to play, a three-point lead and just one second left on the shot clock, Wise drew a shooting foul on a three to bring her to the line. She made all three of her shots to give the Panthers a six-point lead. When the clock expired, Pitt walked off the court with a hard-fought 62-54 victory. The Panthers next test comes against ACC rival N.C. State in Raleigh, Jan. 26 at 7 p.m.